There is a terrific little article in the economist about Avery Island and the family business making McIllhenny's hot sauce. The sauce is great on oysters and mixed into a high quality Bloody Mary cocktail. But in the days of corporate conglomerate's dominating food production the McIllhenny's tabasco business has all the earmarks of a family business with long-term employees living in subsidized housing on an island with parks and amenities. At consulting firm Arthur D. Little there was an old consultant there in the 1990's who had once consulted to the family about contracts for their salt mine. Avery Island is built on a dome of salt. He had a fabulous time working with the family and he did one thing that made the client extremely happy. In the long-term contract for the salt mined on the island, he had them insert an inflation clause. Shortly thereafter inflation heated up (perhaps in the post-war years.) and ﻿the McIllhenny's were protected. He received a thank you package from them every year for years afterward. To read the article click on this to the economist article. 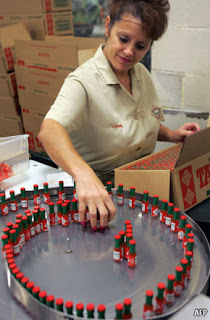 Click on this link to connect to the tabasco web-site.